Joshua Vissers/Daily Mining Gazette Elizabeth Benyi educates voters about Proposal 2 as a volunteer for Voters Not Politicians, a group fighting against gerrymandering. 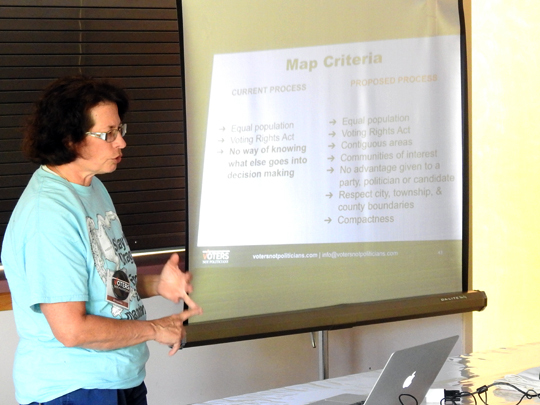 PELKIE — Elizabeth Benyi, a volunteer with Voters Not Politicians (VNP), presented an explanation of gerrymandering and Proposal 2 to a small group at Mission United Lutheran Church on Wednesday night. Proposal 2 suggests the creation of an Independent Citizens Redistricting Commission (ICRC), which VNP believes would eliminate the drawing of district lines by politicians to benefit one party or another, also known as gerrymandering. “I just don’t think that politics as usual is working for everybody,” Benyi said. Gerrymandering has been around a long time, but recent developments in digital data analysis have made computer modeling able to create much more detailed district maps based on many different kinds of demographic data. “It’s just gotten much, much worse,” Benyi said. The two most common kinds of gerrymandering are “packing” and “cracking.” Packing is when district lines are drawn so that all the people likely to vote a certain way are all put into a single district, so they only can win a single representative in a legislature. Cracking is breaking people likely to vote in a similar way apart, putting them in different districts where it’s unlikely they can affect an election. “Michigan is considered one of the most extremely gerrymandered states,” Benyi said. She also highlighted how gerrymandering has been done by both Democrats and Republicans in different states, and the practice can impact both parties equally. When a district is gerrymandered, it makes politicians more secure in their position regardless of voting persuasion and less likely to work across the aisle or respond to voter needs. “The goal of politicians these days is to get re-elected,” Benyi said. Proposal 2’s ICRC would consist of four Republicans, four Democrats, and 5 people who are unaffiliated with either party. Politicians, their employees and their families would be ineligible to be part of the commission. It doesn’t prevent any fundraising or campaigning on the part of candidates. “What it prevents is them not having to do any campaigning,” Benyi said. This commission would draw up district lines in public meetings, with any software or data used to do so available to the public. The proposed map would travel to a series of ten town hall meetings around the state. There would be some cost to the Secretary of State, but VPN estimates it would be about 22 cents per taxpayer. Their polling also suggests that more than 70 percent of Democrats, Republicans and independent voters disapprove of gerrymandered districts. “Change is only possible in Michigan if voters demand it together,” Benyi said.